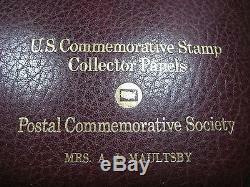 Commemorative Stamp Collector Panels in a very nice Postal Commemorative Society Binder by Mrs. The magnificent book of unique U.
Commemorative Stamp Collector Panels from the Postal Commemorative Society. This book contains illustrations by various artists and a block of 4 or 8 unused U. They are detailed illustrations of the artists interpretations of a particular time or person in U. A unique collectible piece of U. The back of the panel is an illustrated half panel describing the illustration, the stamp and an interesting part of history. The book includes the following panels. 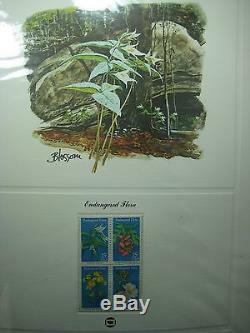 Endangered Flora USA 4 x 15 Cent. Seeing For Me , USA 4 x 15 cent. 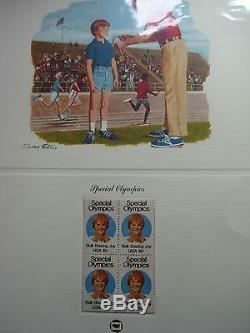 Special Olympics , USA 4 x 15 cent, Skill. 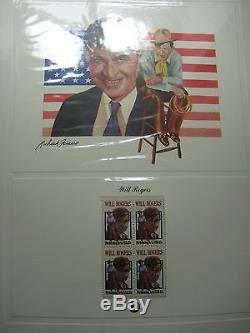 Will Rogers, Performing Arts, USA 4 x 15c. 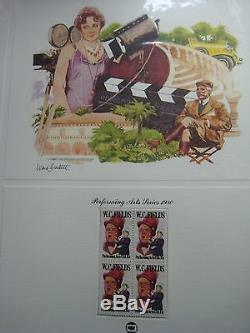 Performing Arts Series 1980 USA 4 x 15c. John Paul Jones , I have not yet begun to fight, U. Bicentennial USA 4 x 15c. 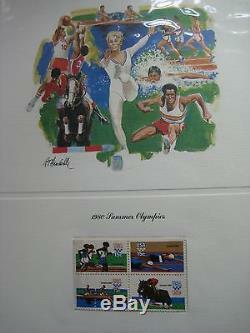 1980 Summer Olympics , USA 4 x 15c. 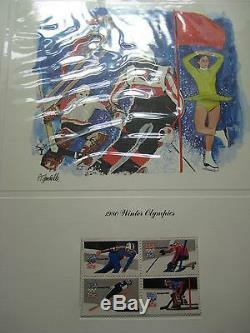 1980 Winter Olympics , USA 4 x 15c (Speed Skating, Skiing, Downhill Skiing and Hockey). 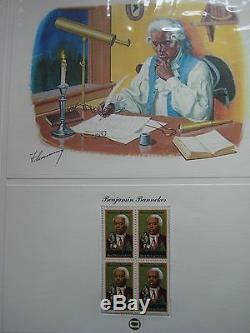 Benjamin Benneker , Black Heritage, USA 4 x 15c. Organized Labor , Proud and Free, USA 4 x 15c. Edith Wharton, USA 4 x 15c. Frances Perkins , USA 4 x 15 cent. Emily Bissell , Crusader Against Tuberculosis, USA 4 x 15 cent. Veterans Administration , Fifty Years of Service, USA 4 x 15c. Helen Keller/Anne Sullivan, USA 4 x 15c. General Bernardo de Galvez, Battle of Mobile 1780, USA 4 x 15c. Coral Reefs, USA 4 x 15c. Indian Masks, Indian Art, USA 4 x 15c. American Education , Learning Never Ends, USA 4 x 15c. American Architecture, (Lyndhurst Tarrytown NY, Smithsonian Washington, Penn Academy Philadelphia, Trinity Church Boston) USA 4 x 15c. Wildlife Habitats USA 4 x 18c. Years of Disables Persons USA 4 x 18c. Professional Management USA 4 x 18c. Space Archievements USA 8 x 18c. Vincent Millay USA 4 x 18c. Alcoholism You can beat it USA 4 x 18c. Whitney Moore Young USA 4 x 15 c. Flowers, Rose Canellia Dahlia Lily , USA 4 x 18 c. American Red Cross USA 4 x 18c. Savings and Loans USA 4 x 18 c. Christmas 1981 - Madonna and Child USA 4 x 18c. Christmas 1981 Traditions of Christmas USA 4 x 18 c.
Babe Zaharias USA 4 x 18c. Frederic Remington American Sculptor USA 4 x 18 c. George Washington USA 4 x 20c. Franklin Delano Roosevelt USA 4 x 20c. John Hanson USA 4 x 20c. Desert Plants USA 4 x 20c. James Hoban USA 4 x 18c. Battles of Virginia Capes and Yorktown USA 4 x 18c. American Architecture USA 4 x 18c. 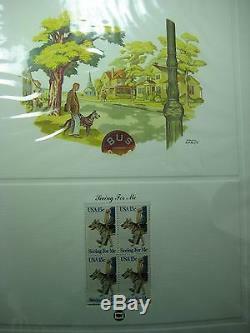 Bobby Jones USA 4 x 18c. Horatio Alger USA 4 x 20c. Aging Together USA 4 x 20c. Library of Congress USA 4 x 20c. Knoxville World's Fair USA 4 x 20c. State Birds and Flowers USA 4 x 20c. Netherlands Recognizes the United States USA 4 x 20c. Christmas 1982 - Madonna and Child USA 4 x 20c. Christmas 1982 Traditions of Christmas USA 4 x 20c. The Barrymores USA 4 x 20c. Mary Walker Army Surgeon USA 4 x 20c. Among 54 pages they are. 22 Collector Panels are with Blocks of 4 x 15 cents stamps. 17 Collector Panels are with Blocks of 4 x 18 cents Stamps. 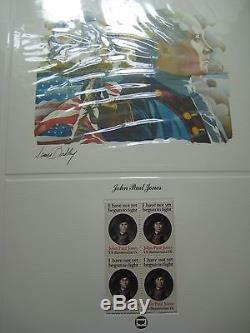 1 Collector Panel is with Blocks of 8 x 18 cents stamps. 14 Collector Panels are with Blocks of 4 x 20 cents stamps. PS: Every Collector Panel has its stamp event description on the back. NOTE: Stamps are in mint condition as it came from the US Post Office with stamps in the original plastic sleeve. Please look at the pictures for details. 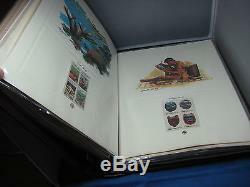 Large Selection of High End US & World Wide Stamps. Please check back daily for new listings. NH: Never Hinged; the stamp has never been hinged and has the original gum as issued by the PO HH: Heavily Hinged OG: Original Gum NG: No Gum. No Gum As Issued Unused: a stamp that has no gum or is regummed VLH. VF: Very Fine; selvage presence, plate or die varieties, and scarcity VFU: Very Fine Used HR: Hinge Remnant Mixed Condition: Faulty to fine B. Please read description very carefully. All weights and measurements are approximate. Your business is VERY IMPORTANT TO US!! Check out our other items. 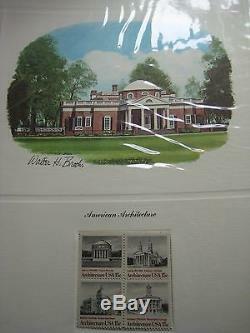 The item "54 US Commemorative Stamp Collector Panels in Postal Commemorative Society Binde" is in sale since Sunday, June 10, 2012. This item is in the category "Stamps\United States\Collections, Lots". The seller is "dasmteam" and is located in Christiansburg, Virginia.